Please join us for a fly fishing school. On Sunday, August 4, a Backwater Angler Guide will be teaching a fly fishing school that is ideal for beginners. If you’re planning on flyfishing Maryland, or anywhere else for that matter, this course is a great introduction to the sport. 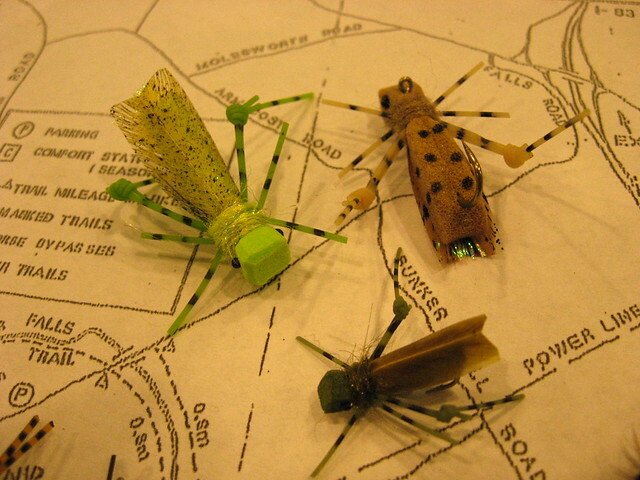 The school covers knots, casting, gear and fly selection. Class is held from 11:00 AM till 2:00 PM. Cost is $125 per person and includes the use of gear. A Maryland non-tidal fishing license and trout stamp is required and may be purchased at the shop with check or cash the day of the school. Class size is limited to 4 and pre-registration is required. Please give us a call at 410-357-9557 to pre-register. This entry was posted in events on July 29, 2013 by Theaux Le Gardeur. 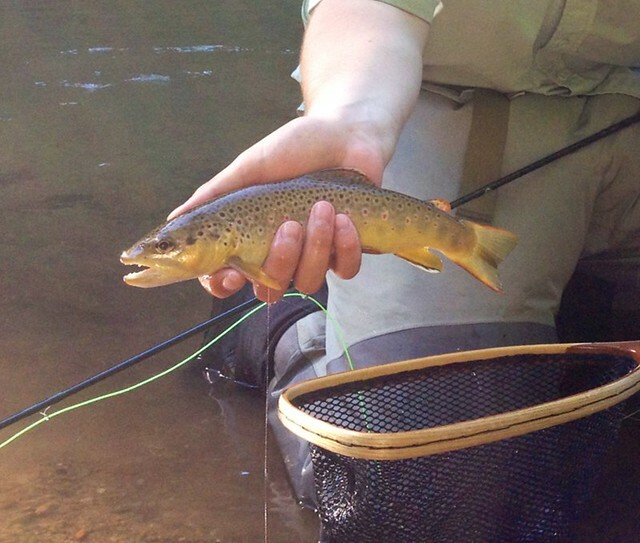 Fly fishing the Gunpowder River the past week has been very productive. Fishing small terrestrials (hoppers, ants, & beetles), midges, and even caddis (tan #16-18) on the river has been the ticket to get fish rising. If the fish seem to not be looking up, nymphing caddis pupa and zebra midges has been very productive. 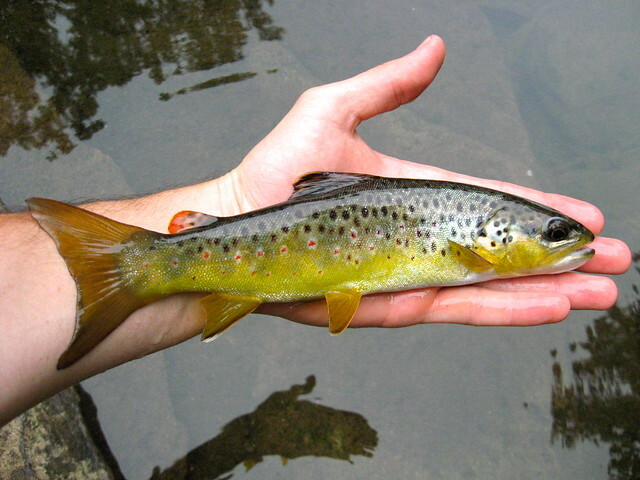 I caught a number of fish downstream of Bunker Hill one evening last week nymphing a combination of these and pheasant tails. The sulfurs have just about ended and we are all starting to look for Tricos. Because the water is so cold, afternoon and evening fishing has been best time to get out and fish. Escape early from work one day this week, beat rush hour traffic and get on the river. We just received a shipment of great terrestrial patterns so if you need to re-stock your box come on in and pick up a couple flies from the muffin tins. This entry was posted in fishing report on July 22, 2013 by Theaux Le Gardeur. Please join us for a fly fishing school. 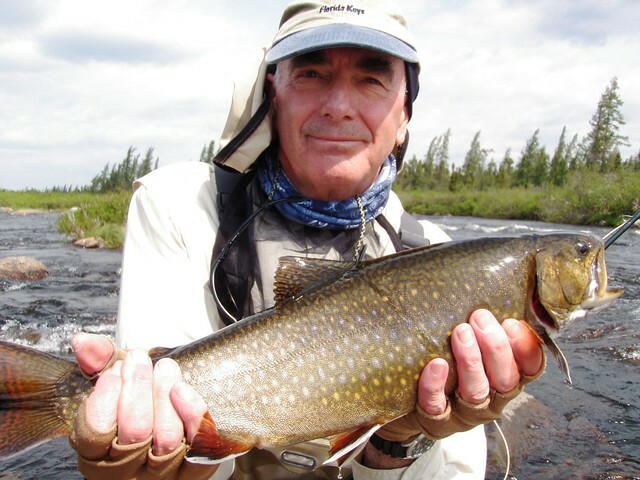 On Sunday, July 21, a Backwater Angler Guide will be teaching a fly fishing school that is ideal for beginners. If you’re planning on flyfishing Maryland, or anywhere else for that matter, this course is a great introduction to the sport. The school covers knots, casting, gear and fly selection. Class is held from 11:00 AM till 2:00 PM. Cost is $125 per person and includes the use of gear. A Maryland non-tidal fishing license and trout stamp is required and may be purchased at the shop with check or cash the day of the school. Class size is limited to 4 and pre-registration is required. Please give us a call at 410-357-9557 to pre-register. This entry was posted in events on July 16, 2013 by Theaux Le Gardeur. As we were unboxing a box of Backwater Angler hats from Imperial Headwear, Jennie found a drake that was trying to blend in with the fading paint on the porch. 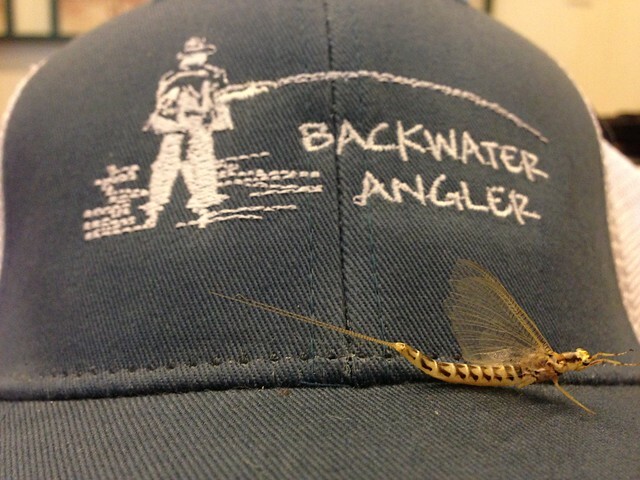 It’s been a while since we’ve seen a mayfly this big in Monkton, MD so we’re feeling that this group of hats may be lucky! This entry was posted in news on July 15, 2013 by Theaux Le Gardeur. The Gunpowder River is clear and flowing at 92CFS and is 51 F. Backwater Angler staffers Mike, Max and Josh have been getting in some great flyfishing this week. Need a little advice as to how they work this fish magic? We just received some slow water caddis from Mike Bachkosky and have plenty of foam and natural beetles, ants and hoppers in the muffin tins. Nymphing has been consistent in the mornings with a small Hare’s Ear and Zebra midge patterns on 6x above Bunkerhill Rd. The water is cold, clear and brisk in the boulder pools. The fish are waiting. Seek out shade and woody debris and get out there and make your own luck. 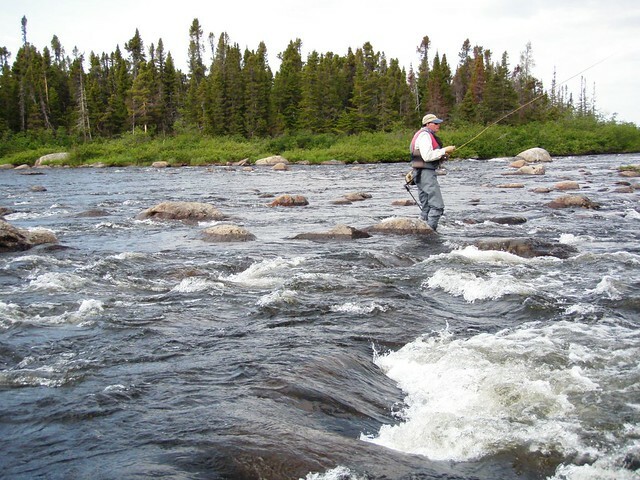 This entry was posted in fishing report on July 14, 2013 by Theaux Le Gardeur. Thanks for moving me towards the Winston Boron IIIX rods–6 and 7 weights as well as the Bauer reels. 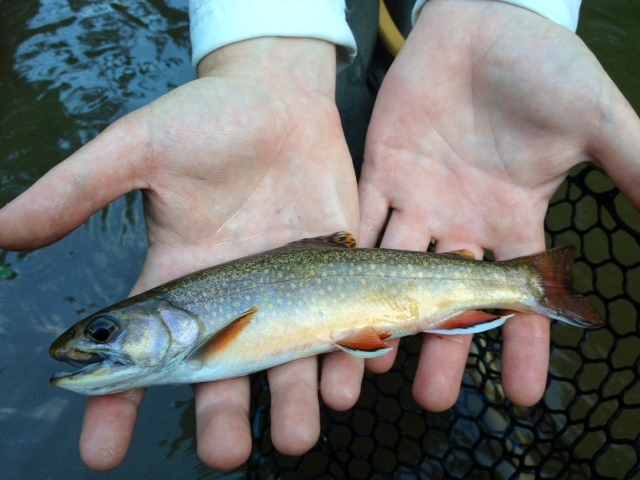 In Labrador the 6wt landed 6 lb brook trout in very heavy water. But for me the best feature of the Borons was line management and line handling ability-particularly hitting small pockets in heavy water. The CFX3 Bauer reel never missed a beat when I landed a 18 lb lake trout on the 7 weight.This equipment has been a good match up for my skill level. Thanks for all your help and great service. 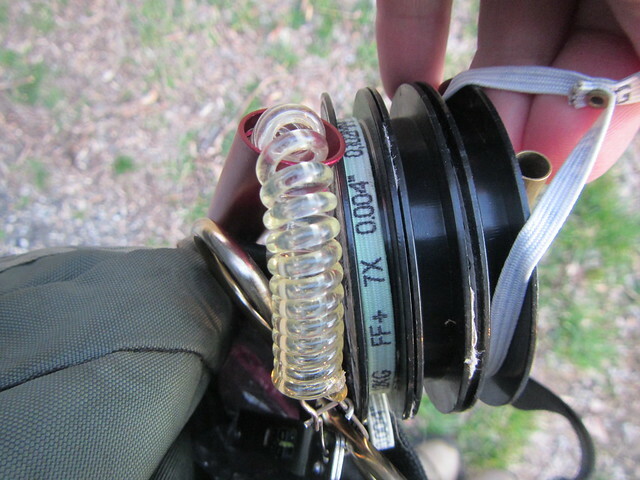 This entry was posted in fishing report, gear, reviews on July 14, 2013 by Theaux Le Gardeur. The light is fading and fish are rising in front of you in a shallow flat and they’ve just switched to emerges. You’ve just spotted a big fish hanging in a root ball and it’s time to change to that articulated streamer from you-know-where. The above photo is evidence that, after Sulphur season, my own kit needed a quick makeover. If yours looks like this in the middle of a spinner fall you won’t soon forget it. As they say, it’s a long walk back to the truck. Rest assured we have tippet and some mighty helpful folks who fish the river a few times a week working at Backwater Angler. And like me, they’re happy to-with apologies to Aaron Neville -“Tell it like it is.” If you have not bought tippet since 1967, (when that one hit the charts), this is a friendly reminder that we do sell all manner of things that will, in fact, get you into more wild fish on the Gunpowder.This is the first post of the revised site that has a few more local stream gauge links in the sidebar and larger pictures and text for those tired old eyes at the office.As always we welcome both your feedback and your stream reports and pictures. A quick look at the archives tells me that we could not have gotten this far without website contributions from our staff and loyal customers. FYI: The shop online portion will be down for a bit but we’ll get to it as soon as the fishing allows. Until then, we welcome one and all to drop in to see the new shop, visit with old friends, tell a fish story or two and get ready for some hot trico and terrestrial fishing. The rocking chairs on the front porch are waiting and the snowball stand in front of the shop is sure to be welcome relief through August. This entry was posted in gear on July 14, 2013 by Theaux Le Gardeur.